Free Hotspot software by Antamedia is the Industry leading software to manage and sell Guest WiFi Hotspot access and Hotel WiFi Internet. It helps you control and bill Internet usage by redirecting customers to login with username and password, social account, email or watch ads. It is suitable for Hotel WiFi, Social marketing, ISPs, Hotspots, Airports, Hotels, and for all purposes where customers should be redirected to the login page to sign in or pay for the Internet access. Upon the successful login, customer will see remaining time and bandwidth, browse the Internet until account expires, and refill the account when needed. Our HotSpot solution works with any active and passive network hardware. You are not required to buy specific access point models and in many cases not even required to reconfigure your network. HotSpot software acts as a gateway - it will accept traffic to one network card, analyze it, and if customer is allowed to browse, it will pass traffic to second network card connected to Internet using preferred line (ADSL, Cable, WiFi...). It is suitable for ISPs, Hotspots, Airports, Hotels, Internet and Cyber cafes. Automate your hotspot by accepting credit card payments with PayPal or one of the 70 supported payment gateways.. 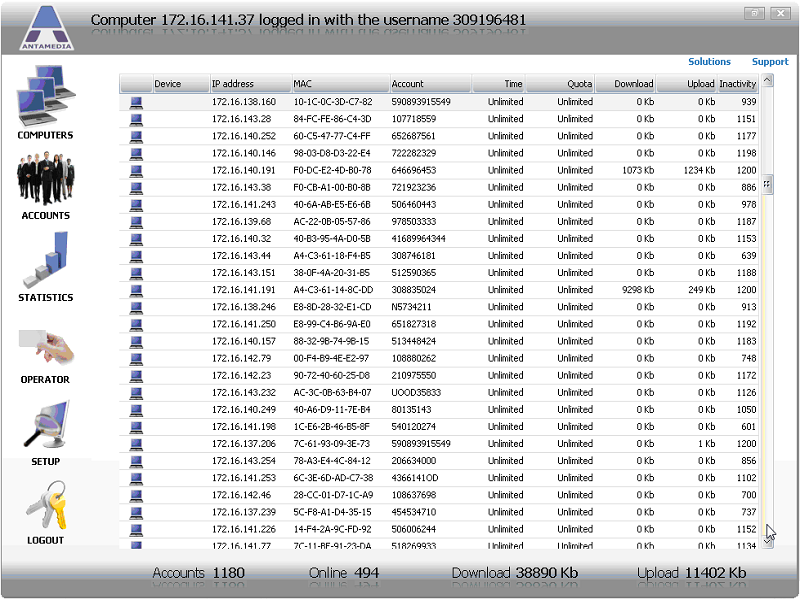 Powerful graphical Windows-based SNMP manager and monitoring software..
Scan all connected devices to your wireless network.